This is the birth story of my second child, you can read the birth story of my first child Adrian who was born at hospital here. I’d been having runs of irregular Braxton hicks that would come and go every 5-10 minutes or so for about a week and was expecting that this child would arrive sooner than my first (who was 6 days late). The morning that labour started I’d been to a baby and toddler group which I help out at and almost as soon as I got home I started getting regular Braxton hicks. The only difference between them and the others I’d been having previously was the regularity of them so I tried to ignore them and carried on as normal. They started getting a bit painful as soon as my husband arrived home at 8pm and by 10pm I was beginning to think, this probably really is labour this time so did a quick check and indeed I was 1cm dilated. I rang up my parents (who had just got into bed, poor them) and told them I thought this was it so could Mum come round as she had agreed to look after Adrian, now 3 years old, for us. Dad said he would drive her over. We then started getting the birthing pool organized, first cleared the space (it was quite big!) then got out the vacuum to ensure there wasn’t anything on the floor that could puncture the pool. Unfortunately all this noise woke up Adrian and he was then very excited and wanted to stay up and help us set up the pool. We laid out a large tarpaulin to keep the floor dry and Martin and Adrian started pumping up the pool together. Meanwhile I was having an energy rush and was buzzing around the place organizing this and that. My parents arrived by around 10:30pm and my Dad said he’d stick around and help us get the pool up and running, so the men pumped and then started filling the pool. It was evident that it would take quite a while to fill it up and I was very anxious that they get a move on as I was very keen to have my water birth. I was having contractions around 3 minutes apart all of this time, which rather worried my mum but I knew they weren’t strong enough to be a worry yet and that birth was quite a while off. She kept asking me to phone the midwife but I wanted to hold off until I felt I needed them, plus phoning the midwife made it much more real and I wasn’t really looking forward to the pain aspect of it all. Eventually I did phone the midwife at around 11pm after I checked myself again and thought I was around 3 or 4 cm dilated. The pain was starting to get worse by then and I had to stop and concentrate on contractions. By the time the midwives arrived at around 12am I was kneeling on the floor leaning over the sofa with Martin rubbing my lower back during contractions. Two midwives attended due to it being a night call out, unfortunately the lead midwife almost immediately upset me by asking me lie on my back during a contraction so she could check the baby’s heart rate and examine me. When I asked her to wait until after the contraction she told me that she had to check the baby’s heart rate to ensure its well being (as if waiting a minute would make much difference). A short while after their arrival I asked if I could get in the pool and was told I could, it was lovely to get in at last even though it still wasn’t full enough (the hot water tank was empty so it was being filled with boiling water from the kettle and cold through the hose). Even though it wasn’t deep enough it still helped with the pain a lot more than I had dared hope. I returned to my kneeling position, leaning against the side of the pool with Martin rubbing my back firmly again. Shortly after entering the pool my Dad took Adrian to bed, I remember giving him a kiss goodnight between contractions. I felt very centered, not really paying anything else attention and remember very little of this time apart from the midwifes saying how calm I was. I found the contractions easier to deal with if I relaxed, and used slow breathing and noises to help me. I went to the toilet a couple of times, having read that it’s useful to get out of the pool now and then as it stimulates stronger contractions. Had to psyche myself up for it and left as soon as one contraction ended to try and minimize the number of contractions on dry land as they where quite a lot more painful. On one of these toilet trips I bled a lot on the bathroom floor and Martin asked the midwife if it was to be worried about. She obviously was and I nervously went back downstairs to be checked over. Baby’s heart rate was fine thankfully and I was 10 cm dilated, but since I had no urge to push they decided to break my waters and have me birth out of the pool so the could monitor me closer. As I was worried about the blood loss I agreed to it and my waters were broken (I’m still amazed by the amount there is!) and then got upright again to encourage descent. Still no real urge to push, but baby fine (they seemed to be checking the heart rate very often at this point). Eventually I was encouraged to push anyway; something I wasn’t keen on as I felt it would use up valuable energy. Eventually the desire to push did come and the pushes were doing more. Still it seemed to take ages before the midwife said she could see baby’s hair, and I distinctly remember feeling the contours of the baby’s face as I pushed it out, something I never felt with Adrian my first as he shot out. Finally my baby was here looking very white as it was covered in vernix. A little girl and certainly smaller than my boy had been. Her breathing was rather rattley which concerned me a little, but the midwives were unconcerned and it eased after a while. 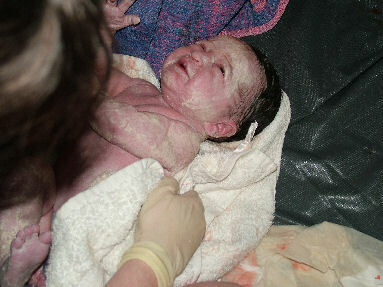 After holding her a while the midwives took her and rubbed her to get some vernix off. It was shortly after this that I realized her cord had been cut, I had specifically wanted a physiological third stage (no drugs) which involves the cord being left in place until it stops pulsating and we had also wanted Martin to be able to cut the cord again as he did with Adrian. I’m still rather upset by this now. When I asked why it was cut I was told it had been too short, but I still feel I should have been asked about it before it was cut. After 30 minutes she told me that they would have to give me the drug as it was their guidelines but I asked them to wait a while longer (knowing that placenta’s can take up to 2 hrs to come away naturally). 5 minutes later it came away by itself. A short while after this my Dad came downstairs (having apparently been lying awake all this time) wondering if the baby had arrived yet and met his granddaughter. Adrian followed shortly after and seeing him meet his sister was wonderful, he was really fascinated by her and wanted to touch and cuddle her. Finally the midwives went away (they cleaned up everything by the way, the only blood found afterwards was a few spots on a sofa cushion which washed out fine) and the pool was emptied out and laid on the lawn to dry off. My Dad left to try have a little sleep at his house before going out to work, while my mum stayed the day to help us out. Being able to go up to my own bed with my family around me was wonderful, I could get the quiet and rest that I needed and tucked up with my new daughter we fell asleep. 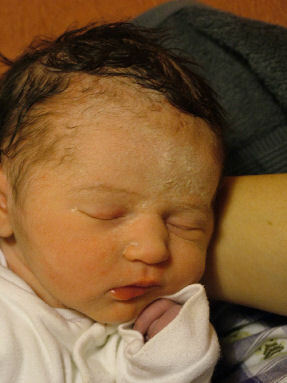 Cassie Beth Lambert was born at home at 3am on the 7th February 2006 weighing 7lb 7oz.